Injuries to the spine are often the result of serious accidents. Powerful impact can damage the spinal cord, spinal nerves, tissue and other components of the backbone including vertebrae and spinal discs. With decades of combined experience serving injured clients in San Diego, our spine injury lawyers at Gilleon Law Firm provide knowledgeable, aggressive representation when you suffer back injury such as a herniated disc due to the negligence of others. The backbone is composed of 33 vertebrae that protect the spinal cord. Between each bony vertebra are spongy intervertebral discs that work as shock absorbers. 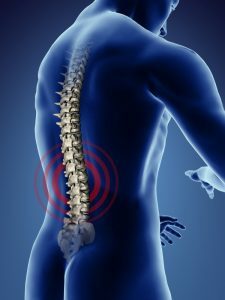 At about an inch in diameter and less than a half-inch thick, with fibrous exterior and gel-filled interior, spinal discs adapt to our actions to provide pain-free movement. By the time we reach middle age, however, blood supply to the discs diminishes, and they toughen and lose elasticity. Pain: Sharp debilitating pain is often caused by displaced disc material. Described by sufferers as excruciating electrical shocks or dull chronic pain, compression and damage of spinal and other nerves by a herniated disc dramatically affects normal life experience and can lead to disability. Changes: You may experience sporadic or ever-present pain, tingling or numbness throughout your body as nerves are affected by the ruptured disc. You may suffer muscle and limb weakness, poor reflexive ability and, in acute situations, bladder and bowel problems. Consequences: Disc herniation occurs more often in the lower spine. A ruptured disc is treated with rest, medication, injection, physical therapy and surgery. With serious disc injury, pain, numbness, loss of function and mobility may be chronic. Like claims for traumatic brain injury, claims for herniated discs and other spinal injuries are complicated and require time to assess the injury and its consequences on your life. Speaking with a personal injury lawyer at the outset of your accident is essential for setting the right stage for your physical and financial recovery. Located in downtown San Diego, Gilleon Law Firm handles serious injury cases for people facing an uphill battle. Providing superb client service and tenacious legal representation, we settle no claims below their value. When you call, we listen. Call 619.702.8623 or contact us today to set up a free initial consultation.